On Friday, August 21, 2015, the BALAC Program Director, Assoc. Prof. Surapeepan Chatraporn, along with eight BALAC Program instructors, Mrs. Vipa Homsiri, the Director of the Academic Affairs Office of the Faculty, the three BALAC Program staff, and four BALAC student representatives, welcomed 35 foreign students from various countries both from the East and the West. The event, which started at 4:30 PM in the Dipak C. Jain Hall of the SASA International House, also included 51 BALAC students. Besides welcome messages and introductions from those present, plans were announced for three weekend outings for foreign students during the semester, along with arranging for a Thai “buddy” from the BALAC Program to be assigned for each exchange student. Lively conversation then took place during a buffet dinner. The evening’s event ended around 7:00 PM. Assoc. Prof. Surapeepan’s welcoming message warmly greeted the students from abroad, touching on the importance of international education and a cosmopolitan vision for all students today. She was delighted to see so many energetic students from so many countries and hoped that many BALAC students would like wise plan to study abroad. 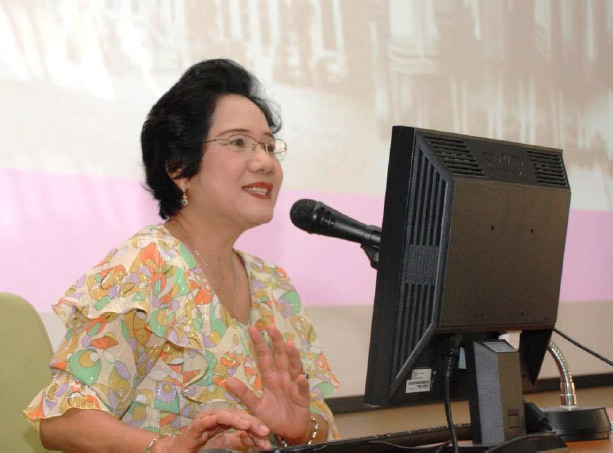 She tied her welcome and hopes to the cosmopolitan ideals of King Chulalongkorn and the international vision of Chulalongkorn University, which is soon approaching the centenary of its establishment. 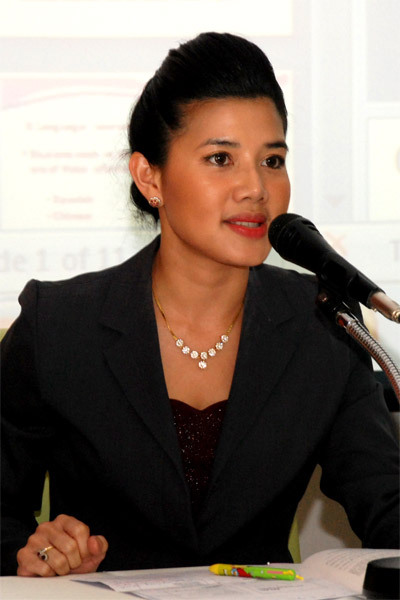 While asking foreign students to take opportunities for learning about Thailand and her people both in and out of the classroom, she also reminded them that they should remain cautious and aware of their environment so they would be sure to remain safe and to enjoy their time here fully. The BALAC Staff, Administrators, and Faculty were all here to ensure that all foreign students would benefit the most possible from their time at Chulalongkorn University and in Thailand. The evening’s events were also aiming to create new bonds of friendship and assistance between BALAC students and the foreign students that would continue through the semester and into the future. Following her short introductory welcome speech, Assoc. Prof. Surapeepan invited all Ajarns present to introduce themselves, which they did in succession, starting with Aj. Dr. Simon Turner, Aj. Dr. Jaime Moreno Tajeda, Aj. Dr. Lowell Skar, Aj. Dr. Paolo Euron, and Aj. Dr. Sirivan Chulakorn. A highlight of the Program faculty introductions came when Aj. Dr. Asadayuth Chusri gave a rousing rendition of “Getting to Know You” to both laughter and applause, and was followed by further faculty introductions from Aj. Somjit Jirananthiporn and Aj. Albert Bosch. Mrs. Vipa Homsiri then briefly introduced herself as well since foreign students may contact her about their academic affairs. The leaders of the BALAC students, Mr. Kasidit Sornvai and Ms. Hathaiphat Kongpoe, assisted by Mr. Papol Dhutikraikriang and Ms. Lalin Sathirakorn then took over the proceedings. They first announced that there would be three Sunday trips planned for foreign students outside of Bangkok in the Fall, the first to the Khlong Khon Mangrove Forest Preservation Center on August 30, the second, on October 11, to a nearby floating market and the last, to a surprise and as yet unannounced location, on November 8. The student organizers also announced that each foreign student would be assigned a BALAC student “buddy” later that evening, to whom she or he could turn in the remainder of the semester if there was any problem or question. Those announcements were then followed by short introductions from each of the foreign students in attendance, giving their names, where they were from, and whatever they would like their new friends to know them by. A group photo was taken in front of the SASA International House building of the foreign students along with the BALAC Faculty and Staff. These events were followed by a buffet-style dinner of several delicious dishes and desserts prepared by the SASA Restaurant. During dinner, BALAC students were assigned to foreign students during in the Dipak C. Jain Hall, while BALAC Faculty and Administrators socialized in the Sasa Alumni Room nearby. The orientation for international students at Sasa International House ended around 7:00 p.m. The Bachelor of Arts in Language and Culture (International Program), or BALAC, is entering its 8th year. This year, the program has accepted 99 new students through direct admission, and 2 students through international admission. Also, there are 75 new graduates who started their undergraduate program in 2011. Of these, 7 received first class honors, and 26 received second class honors. 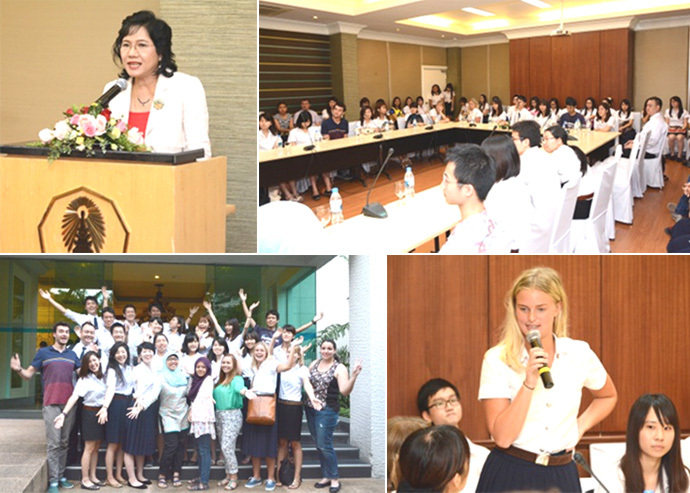 The BALAC Student Orientation and Parent Meeting was held on July 24, 2015, from 9 a.m. - 4 p.m. in Room 301-302 of the Maha Chakri Sirindhorn Building. New students and their parents had the chance to meet faculty board members and lecturers, and obtain information about classes and student regulations. Around 180 new students and parents joined. Assist. Prof. Dr. Prapod Assavavirulhakarn, the Dean of the Faculty of Arts, gave the opening remarks and presented certificates to the 7 above-mentioned graduates who received first class honors. These are Mr. Jakkapat Kuhapremkit (Gold Medal), Mr. Chanwit Eimudom, Mr. Tanarat Chaichompu, Mr. Porames Tungsataporn, Miss Watanya Sompong, Miss Wasitta Chayanupatkul, and Mr. Wisrut Homhuan. In addition, Assist. Prof. Dr. Prapod presented certificates to 10 students for their service to society and the community. These include Mr. Pasawit Boonkongcheun, Miss Arada Arayawut, Mr. Ronakorn Rojrattanadarong, Mr. Wisrut Homhuan, Miss Tanyaporn Roongreungtanya, Mr. Chanwit Eimudom, Miss Nichamon Srichaiyongpanich, Miss Nichada Teanchao, Miss Parima Chanrawi, and Miss Chindarat Sopasripan. Then, Assoc. 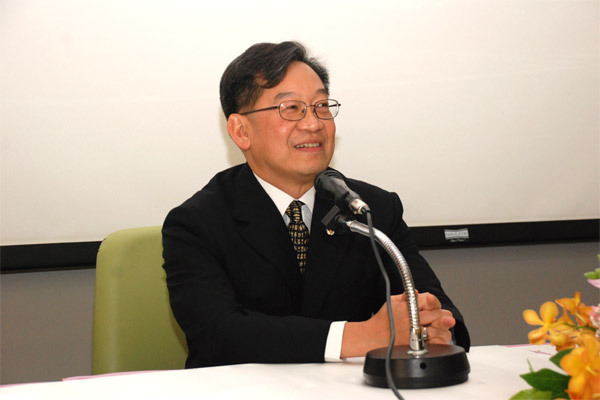 Prof. Surapeepan Chatraporn, Program Director, introduced the Faculty of Arts and provided information on the BALAC program. Additional focus was on program development for international purposes, extra-curricular activities, more international students, and student exchange program abroad. After that, Assoc. Prof. Sankavat Pradithpongse, the Deputy Dean for Student Affairs, talked about life and activities on campus. Three Arts alumni were invited to share their stories on education and work opportunity after graduation. These include Mr. Thongchai Chasawat, the Director-General of the Department of Consular Affairs of the MFA, Ms. Chernchooti Tempitak, Refugee Officer of UNHCR, and Ms. Alice Toy, MC and actress at GMM and owner of Mr. Bean Coffee Shop. The alumni shared their experiences gained at Chula and their career success. Assist. 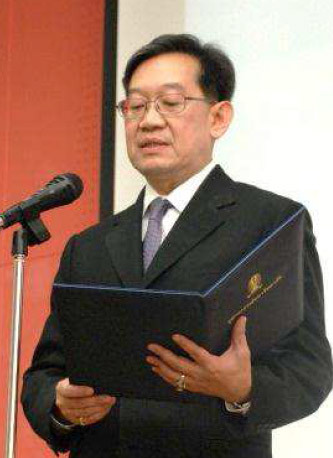 Prof. Dr. Duantem Krisdathanont was the MC. For the afternoon session, Assist. 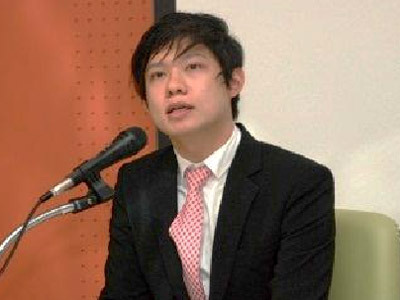 Prof. Dr. Duantem Krisdathanont, the Deputy Director of the program, explained the curriculum and courses in the program. Ajarn Dr. Lowell Skar, and Ajarn Dr. Jaime Moreno Tejada gave an introduction to cultural studies. Then, new students had a chance to meet and talk with their advisors. There are 4 new advisors this year: Ajarn Dr. Jaime Moreno Tejada, Ajarn Dr. Simon Turner, Ajarn Dr. Wiroj Kosolritthichai, and Ajarn Nenuphar Supavej. The advisors provided information on courses, registration process, and life at the Faulty of Arts. Although this session was primarily meant for new students, some of the parents stayed on. The Student Orientation was successful. New students as well as their parents were interested, and exchanged useful opinions and suggestions. The orientation ended at about 4 p.m. The Section of International Affairs collaborated with Hokkaido University in organizing a joint project on academic and cultural exchange. On August 21, the Faculty of Arts welcomed 17 students from Hokkaido University who came on a short study tour and intercultural exchange led by Pof. 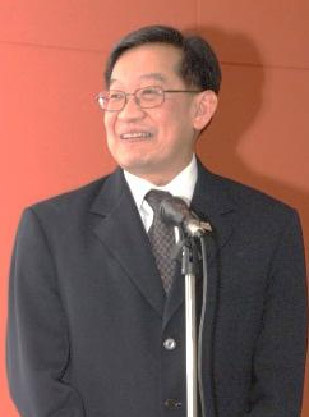 Mikio Masaki. The Arts student who participated in this activity included both the BALAC students and students from the Thai program, who major in Japanese. Ajarn Dr. Asadayuth Chusri was the coordinator of the activity. Assist. Prof. Dr. Prapod Assavavirulhakarn, Dean of the Faculty, gave a speech in which he warmly greeted the Hokkaido students and invited them to make friends with the Art students and maintain the good relations. Assoc. Prof. Surapeepan Chatraporn, Deputy Dean for International Affairs, gave a short introductory talk on the Faculty of Arts, expressed her delight in this collaborative project and expressed her goodwill to all the Japanese students in this immersion program. For the morning session, Assistant Prof. Dr. Wasana Wongsurawat, Director of Thai Studies, gave a short talk on a glance of Thailand and Thai culture. After the talk, she led a discussion on the exchange of culture and the values of Japan and Thailand, in which students from both institutes actively participated. The focus in the afternoon session was on the students. The student representatives of each university introduced their university. Then all students enthusiastically exchanged ideas on and attitudes toward their university lives. They shared their hopes, their dreams and solutions to their problems. 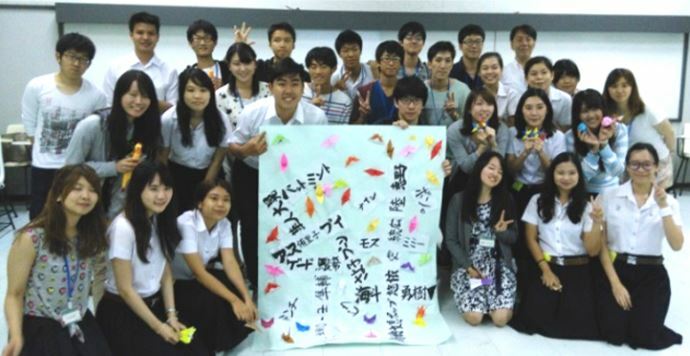 The event concluded with the students writing their names and put all these together to make the word “KIZUNA” which means friendly bonds. On July 16, 2015, from 10 a.m. - 12 p.m. in Room 708, Boromrajakumari Building, 12 faculty members from the Faculty of Humanities, Srinakharinwirot University, visited the BALAC program and gathered in Room 708, Boromrajakumari Building, to acquire useful suggestions on how to design and manage their international program, and tackle problems that may arise. The party includes Assist. Prof. Dr. Siriporn Panyamethikul, the Director of the English for Careers international program, 10 faculty members from the Faculty of Humanities and 10 graduate students. Assoc. Prof. Surapeepan Chatraporn, Director of the BALAC program, Assist. 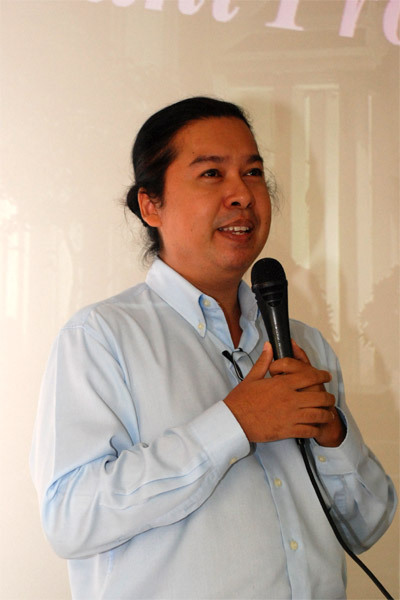 Prof. Dr. Duantem Krisdathanont, the Deputy Director of the BALAC program, Assist. Prof. Dr. Villa Vilaithong, Program Board Member, and Ajarn Dr. Asadayuth Chusri, faculty lecturer, welcomed the party, and discussed and offered suggestions about program development and management. They also answered questions and provided solutions to existing problems. The Faculty of Humanities at Srinakharinwirot University offers English for Careers international program starting in academic year 2015, with four fields, including English for Mass Media, English for Hospitality and Management, and English for Business. On Friday, July 17, 2015, our international Bachelor of Arts Program in Language and Culture (BALAC) organized a faculty lecturer annual seminar for the academic year 2015 at Courtyard by Marriott from 10.30 a.m. to 4.00 p.m. The conference was chaired by Assoc. 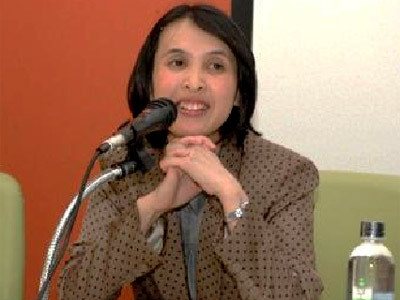 Prof. Surapeepan Chatraporn, Director of the Program, and attended by faculty lecturers and representatives from the departments of Thai, English, Philosophy, Dramatic Arts, Comparative Literature, Geography, Western Languages, and Eastern Languages, as well as the Director for Academic Affairs, and other faculty and staff, adding up to 30 people. The conference started with the introduction to CUCAS, and the discussion among participants on how to enhance teaching methods and encourage students to complete teaching evaluation forms for further improvement. The participants also discussed the student exchange programs and academic cooperation with foreign universities to provide a truly international teaching and learning environment. In addition, the participants exchanged their views on previous problems, such as academic dishonesty, class attendance, books and teaching materials, student uniforms, grade appeal, and credit transfer. The Program gathered and summarized the results from the conference as guidelines for current and future faculty lecturers’ reference to facilitate effective teaching and learning. The Spanish Section, the Latin American Center, the Department of Western Languages, and the International Affairs Section of the Faculty of Arts collaborated with no fewer than 7 embassies of countries with Spanish speakers (Argentina, the Republic of Chile, Colombia, Mexico, the Republic of Peru, Cuba, and Spain) to organize ‘Hispanic Week’ for Thai and international students who study Spanish and Latin American cultures. The event took place from March 16 to 19, 2015 with a purpose to increase students’ knowledge and experience in languages and cultures of countries with Spanish speakers. Ambassadors of six embassies joined in the opening ceremony. : H.E. Ana María Ramírez (Argentina), H.E. Javier Becker, (Republic of Chile), H.E. 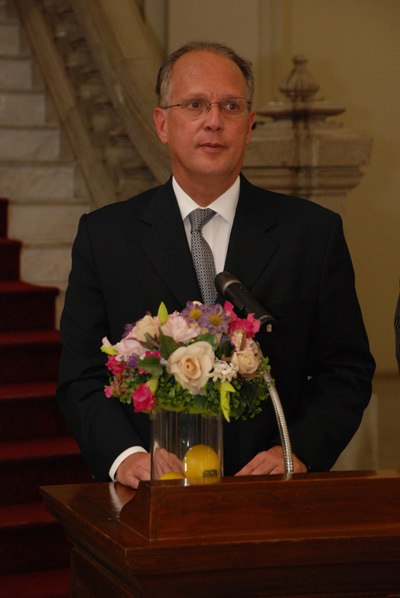 Andelfo García (Colombia), H.E. 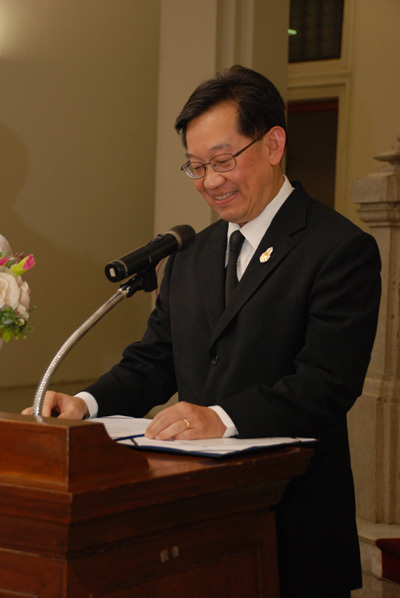 Jorge Chen (Mexico), H.E. Felix Denergri (Republic of Peru), and H.E. Victor Ramirez Peña (Cuba). Associate Professor Surapeepan Chatraporn, the Deputy Dean for International Affairs welcomed the ambassadors and participants, and the Ambassador of the Embassy of Argentina gave opening remarks. There were Spanish and Latin American dance shows presented by the embassies, and a ceremony to present prizes to winners of the contest by the ambassadors. Then, Associate Professor Surapeepan presented flower bouquets to all the ambassadors for their support and cooperation in organizing Hispanic Week. The event ended with a Spanish and Latin American food exhibition and small talks in the reception. The week-long Hispanic Week included Spanish and Latin American culture contests, Salsa and Flamingo dance demonstrations, and cooking demonstrations that featured Spanish paella, Mexican taco, and Peruvian Ceviche. Moreover, knowledgeable speakers from outside were invited to give talks on Latin American culture. Hispanic Week received much attention from students, faculty members, as well as the public. Not many things draw as much attention and interest as scholarship events, and the “OCSC, Fulbright and Australian Government Scholarships” lecture was no exception. 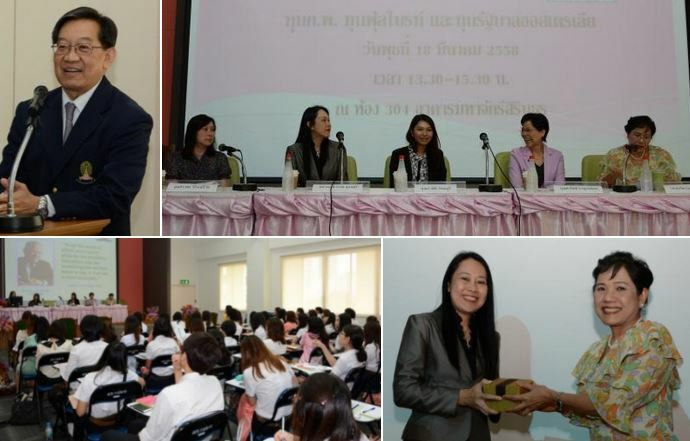 The Faculty of Arts’ International Affairs Division hosted it on Wednesday, March 18, 2015 from 1.30-3.30 p.m. in Room 304 of Maha Chakri Sirindhorn Building. Assistant Professor Dr. Prapod Assavavirulhakarn, Dean of the Faculty of Arts, gave opening remarks. Associate Professor Surapeepan Chatraporn, Deputy Dean for International Affairs, was the MC. Speakers included Khun Jiraphorn Wirojcheewan, Senior Human Resource Officer of the Office of the Civil Service Commission (OCSC), Assistant Professor Benjawan Ubonsri, Director of the Thai-American (Fulbright) Foundation, Khun Supawaree Patravanich, Junior Program Officer of Fulbright, Khun Pasinee Ratanaburi, Scholarship Officer of the Australian Embassy’s Australia Education International, and Khun Porntip Kanjananiyot, former Director of the Thai-American (Fulbright) Foundation. Many students were interested in the lecture, and many questions were asked. In the end, the Deputy Dean for International Affairs presented tokens of appreciation to all the speakers. The lecture was attended by 120 Arts students and alumni, as well as students from other faculties. In September 2014, the BALAC program organized an orientation and reception for BALAC and exchange students at Sasa International House to welcome foreign students, provide information about the Faculty and the program, and assign a buddy to each foreign student. 29 foreign students, 70 BALAC students, and 8 professors participated in this orientation. Associate Professor Surapeepan Chatraporn, Director of the BALAC, welcomed foreign students and provided information on classes and life in Faculty of Arts’ BALAC program, and at Chula. Then, all the professors and staff as well as the new students from Japan, Germany, Sweden, Indonesia, Brunei, England and the US introduced themselves. The highlight of the orientation was the presentation of three field trips to learn about culture, history and the environment at Damnoen Saduak Floating Market in Ratchaburi, the Elephant Show in Nakhon Pathom, the historic site in Phra Nakhon Si Ayutthaya, and Khlong Khon Forest at Mangrove Forest Conservation Center in Samut Songkhram. The purposes of the field trips are to educate students in Thai history, culture, lifestyle and environment, and to promote close relations and strong networks between the BALAC program and foreign students. Faculty lecturers and students, as well as staff, will join these field trips. After that, students and professors enjoyed a great meal. This orientation and new student welcoming party was a good start and opportunity for foreign students to get to know one another and their Thai buddies, and to acquire useful information about life and study at Chula. In the present era, everyone aspires to be part of the international community. The Faculty of Arts, too, aims to internationalize. One of the factors that can make this possible is to gain more full-time international students: guideline-wise, they are supposed to make up at least ten percent of the total number of students, which would mean increasing the number of exchange students to at least 40 each year. 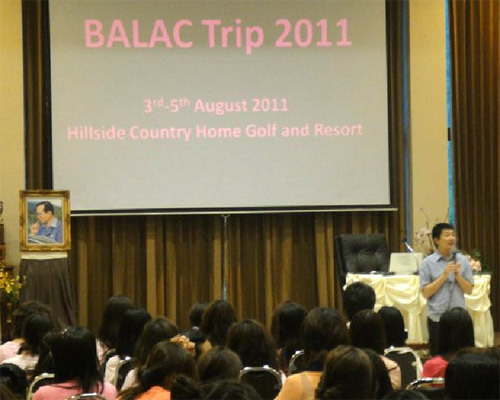 The latest BALAC seminar, held on August 16, 2014 at Novotel Siam Square, identified possibilities and strategies to promote such internationalization. Associate Professor Surapeepan Chatraporn, BALAC Director, had invited Assistant Professor Dr. Kriengkrai Boonlert-U-Thai, Assistant Rector of Chulalongkorn University, and Professor Glen Chatelier, Director of International Affairs, Assumption University to share experiences and progress. 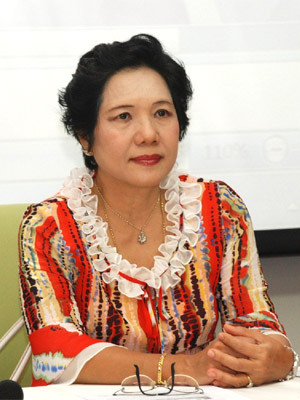 After Associate Professor Surapeepan’s introduction to the BALAC program’s measures and commitment to gain more foreign students and prepare Thai students for student exchange abroad, Assistant Professor Dr. Kriengkrai, one of the experts in Chula’s international programs and former Director of Faculty of Commerce and Accountancy’s BBA, emphasized that the long-term goal of having a ten-percent rate of international students must not lower our high educational standards, and that targeting students in Asia makes sense. Moreover, we can attract more students through inter-university networks, exchange and internship programs, educational planning, and credit transfer. Professor Glen Chatelier, Director of International Affairs, Assumption University, one of the universities with the highest number of foreign students, shared experiences in becoming part of the international community and how to enhance international affairs, which could benefit the BALAC. 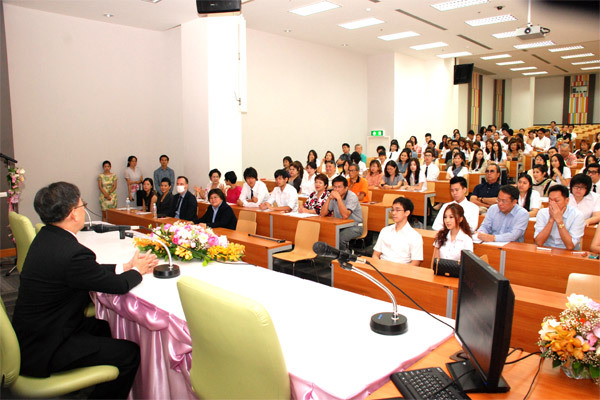 Focus should be on quality educational materials, participation in educational exhibitions arranged by various agencies, especially abroad, hosting academic events such as seminars, building foreign alumni relations, maintaining an interesting website, and arranging field trips in Thailand for people interested in learning and sharing experience in a short-term period. Professor Glen also added that even though Chula is slow in opening up to internationalization compared to other universities, being a “leading university” in the country will help a lot in the long term. 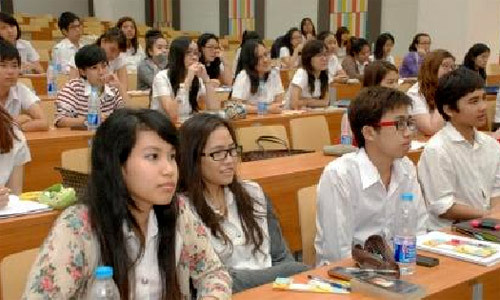 The afternoon session was devoted to discussion and brainstorming of professors, program executives, and lecturers about issues such as strategies to attract foreign students, courses to reflect Thai values, student exchange and internship programs, international academic programs such as seminars, and the new website’s design. Around 30 professors and lecturers participated in this seminar. At 11.30, on November 17, 2014, Assistant Professor Dr. Prapod Assavavirulhakarn, the Dean of the Faculty of Arts, presided over the Khyentse Foundation Scholarship Award Ceremony at the Arts Library, Maha Vajiravudh Building. Dr. Peter Skilling, the representative from the Khyentse Foundation Thailand, awarded US$ 1,000 to Miss Chatuporn Petchaboon, a PhD candidate in Thai Folklore, Department of Thai. 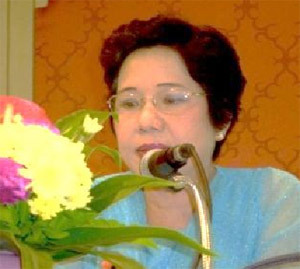 The scholarship committee consisted of Associate Professor Surapeepan Chatraporn, the Deputy Dean for International Affairs, Ajarn Dr. Sirivan Chulakorn, and Ajarn Dr. Charnwit Tadkaew. The Khyentse Foundation was founded in 2001 by Mr. Dzongsar Khyentse Rinpoche with an aim to promote Buddhism and Buddhist studies. The Foundation supports online data management of the Tibetan Tripitaka, and Buddhist studies in universities. The Foundation has given the Faculty of Arts US$ 3,000 to be awarded to a selected student every year for three consecutive years. Each scholarship is worth US$ 1,000. Retirement celebrations are always a big draw and important event at the faculty. 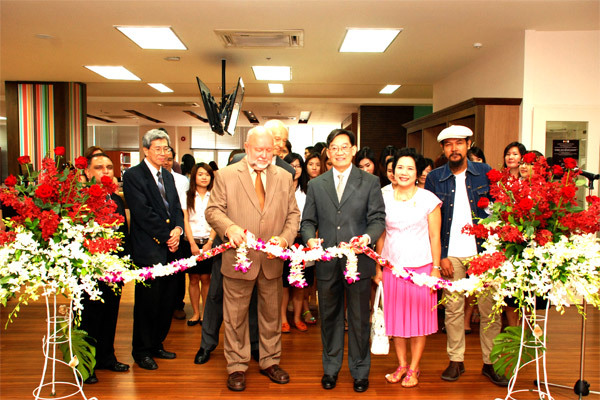 The Dean of the Faculty of Arts had asked the Section of International Affairs to host the 2014 celebration on Thursday, September 18, 2014, in Room 111, Maha Chulalongkorn Building. That year, nine faculty members retired: Professor Dr. Theraphan Luangthongkum, Professor Dr. Siraporn Nathalang, Associate Professor Dr. Suwanna Satha-anand, Associate Professor Dr. Wanna Saengaramruang, Associate Professor Sukanya Sujachaya, Assistant Professor Krissara Warissarapuricha, Mrs. Phatcharee Chimtaworn, Mr. Praphan Kham-orn, and Mr. Prasop Swangdee. The event started with a performance of two songs: “Neung Nai Roi,” and “Cheun Chee Wit” sung by faculty members from different departments. These included Associate Professor Surapeepan Chatraporn, Assistant Professor Sunij Sutanthavibul, Assistant Professor Sankavat Pradithpongse, Ajarn Dr. Sirivan Chulakorn, Ajarn Dr. Pasuree Leusakul, Ajarn Dr. Aratee Kaewsumrit, Ajarn Dr. Wannachai Kampeera, Assistant Professor Dr. Poramin Jaruworn, Ajarn Dr. Arthid Sheravanichkul, and Ajarn Dr. Asadayuth Chusri. Assistant Professor Dr. Duantem Krisdathanont was the pianist, and Ajarn Scott Oltmann was the guitarist. After the show, the Dean presented a flower bouquet to Associate Professor Charunee Hongcharu, the choir conductor. The Dean then delivered his remarks and opened the retirement celebration. The retired faculty members also shared their fond memories of the Faculty of Arts with the audience and expressed appreciation of the PowerPoint presentation. The Dean presented gifts bestowed by H.R.H. 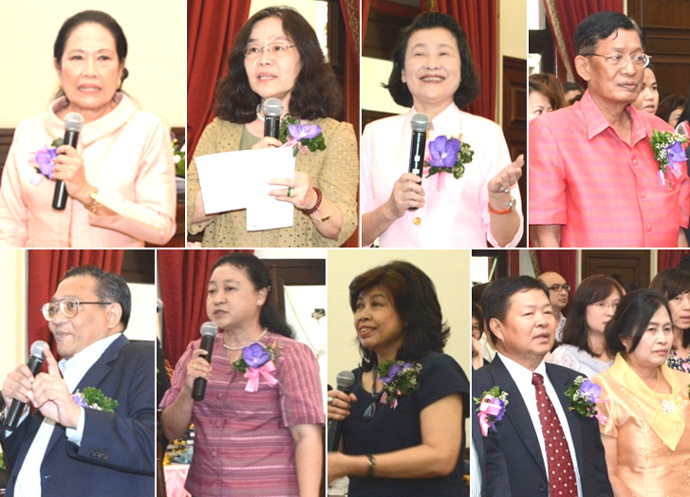 Princess Maha Chakri Sirindhorn to the retired faculty members. He also presented gifts from the Faculty of Arts that engraved their names, and gifts that he had prepared for them. Faculty members and staff expressed good wishes to the retired faculty members, and joined a snack session. The event was filled with admiration, warmth, and generally pleasant impressions amid the beautifully arranged flowers. The MCs were Assistant Professor Dr. Julispong Chularatana, Ajarn Dr. Pasuree Leusakul, and Ajarn Dr. Suebpong Changboonchoo. The event was attended by over 100 faculty members and staff. The Bachelor of Arts Program in Language and Culture (International Program), or BALAC of course, is celebrating its 7th year. This year, there are 96 new students, and we have 57 graduates who started their study in 2010. Of these graduates, 10 earned first-class honors, and 18 second-class honors. 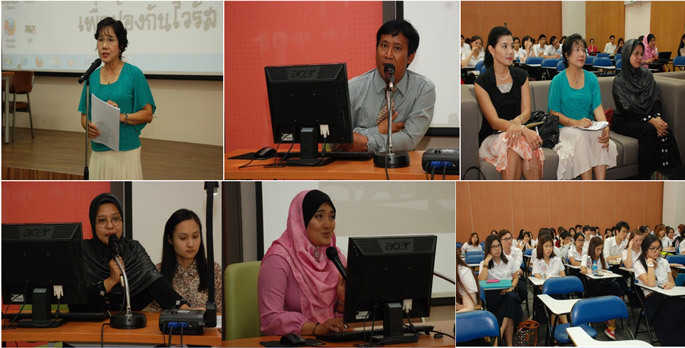 BALAC organized a new student orientation and parent meeting for the Academic Year 2014 on August 1, 2014, from 9.00-16.00, in Room 301-302 of the Maha Chakri Sirindhorn Building, to allow new students and their parents to meet with the BALAC Board and faculty, and to attain information on classes and regulations. There were 160 people—new students and parents—attending this event. The event started with Assistant Professor Dr. Prapod Assavavirulhakarn, the Dean of the Faculty of Arts, delivering his opening remarks, sending warm wishes to new students, and awarding certificates to the above-mentioned ten graduates with first-class honors. These included Mr. Supakorn Yuenyongwannachot (with Gold Medal), Miss Narawal Bunyapisompan, Miss Kanokwan Pornngarm, Miss Chiang Lee, Miss Chananart Feungfusakul, Miss Nisara Sittakarndech, Mr. Peerapat Ouysuk, Miss Sawita Metiranan, Miss Siriprapa Saparat, and Miss Artita Boonthong. Assistant Professor Dr. Prapod also awarded certificates to 16 students who carried out volunteer work to benefit society. These included Miss Narawal Bunyapisompan, Miss Kanokwan Pornngarm, Miss Chiang Lee, Miss Chananart Feungfusakul, Miss Nisara Sittakarndech, Mr. Peerapat Ouysuk, Miss Siriprapa Saparat, Mr. Supakorn Yuenyongwannachot, Miss Chadchanid Setaruji, Miss Tanita Ketkittikhun, Mr. Thanakorn Visetjung, Miss Sutitan Chaotrakulkit, Miss Isara Rachatrachu, Miss Sasisolos Angsutornset, Miss Natmada Chunhawan, and Miss Warintorn Lertnimitpan. After the awarding ceremony, Associate Professor Surapeepan Chatraporn, the Deputy Dean for International Affairs, gave an introduction of the Faculty of Arts and the BALAC Program. Focus was on curriculum development and activities to promote the creation of an international environment. Next, Assistant Professor Sankavat Pradithpongse, the Deputy Dean for Student Affairs, talked about activities and life on campus. Then, three Arts alumni shared their experiences on campus, job opportunities, and success that were built on their study at Arts. The three Arts alumni were Khun Nantiya Sawangwuttham, the Head of the Government Inspector (Level 10), Ministry of Culture; Khun Monrudee Ketpan, the Director of the Bureau of Foreign Affairs, Thai Airways International Public Company Limited; and Dr. Tinsiri Siripo, the Deputy Director of the Management and Communications Unit, SEAMEO. This session was led by Ajarn Panita Silapavithayadilok. In the afternoon, Assistant Professor Dr. Duantem Krisdathanont, the Deputy Director of BALAC, explained the BALAC program and the courses in more detail, and Ajarn Dr. Lowell Skar and Ajarn Dr. Jaime Moreno Tejada introduced Cultural Studies, the core of the program. The whole session was led by Ajarn Proud Sethabutr. After the session, the new students had the opportunity to meet with their advisors. In this academic year, there are four of those. They provided students with information on classes, registration, and life at the Faculty of Arts. The new student orientation was a success: students and a lot of their parents were interested, and shared comments and opinions. The session was over at 16.00. AIMS does not apply to Japan only. On the contrary, it is closely linked to ASEAN, as the full name of the program, ASEAN International Mobility for Students, suggests. Needless to say, it is worth knowing for all our students. Thus, on March 18, 2014, from 12:00 P.M. to 1:00 P.M., Assoc. Prof. Surapeepan Chatraporn, Deputy Dean for International Affairs organized a talk on “Student Exchange Scholarships under the ASEAN International Mobility for Students (AIMS) Program” for BALAC students. Around ninety BALAC students joined in Room 314 of the Maha Chakri Sirindhorn Building. 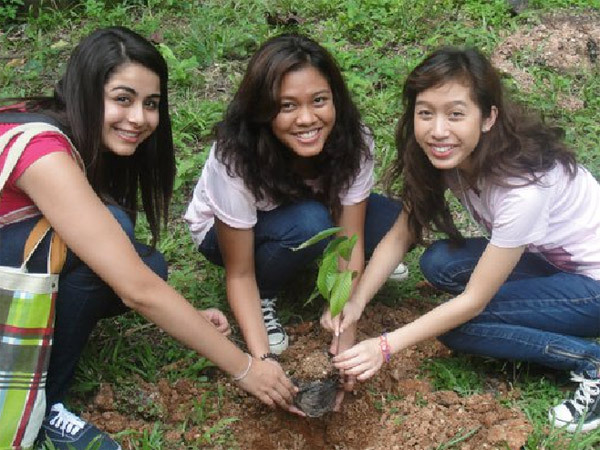 AIMS is a student exchange program between Thailand and other universities in the ASEAN region. This talk focused on Malaysia and Indonesia. The speakers were Dr. Hamam Supriyadi, a lecturer from Gadjah Mada University in Indonesia and special Indonesian lecturer at Thammasat University, and Ajarn Dr. Nureeda Hayiyakoh, Head of the Malaysian Department. Both speakers presented photos and introduced schools and universities in Indonesia and Malaysia. The talk ended with Miss Nareema Sangwiman, a PhD candidate in Literature and Comparative Literature, giving an account of her experience as an exchange student at University of Malaysia. Therefore, the talk gave students not only the necessary information to participate in this exchange program to gain knowledge and experience abroad, but also a lot of motivation and encouragement. The Section of International Affairs, Faculty of Arts, in collaboration with the Faculty of International Relations at the College of Social Science and Humanities, Vietnam National University of Ho Chi Minh City organized an event labelled "Vietnamese-Thai Friendship for ASEAN," which took place on January 11, 2013, from 9 to 12 a.m. in Room 304 of the Maha Chakri Sirindhorn Building. Participating in the event were six faculty members and 80 students from Vietnam National University of Ho Chi Minh City. The event started with a dance of welcome and a blessing ceremony performed by the students of the Faculty of Arts. Then Assistant Professor Dr. Prapod Assavavirulhakarn, Dean delivered a speech in which he expressed his delight in this second activity co-organized by the Faculty of Arts and the College of Social Science and Humanities and his pleasure in seeing the close ties between the students of the two institutions. Present at the event were Associate Professor Surapeepan Chatraporn, Deputy Dean for International Affairs, Assistant Professor Sankavat Pradithpongse, Deputy Dean for Student Affairs, Assistant Professor Dr. Duantem Krisdathanont, BALAC Deputy Director, Assistant Professor Dr. Julispong Chularatana, Ajarn Dr. Penpisa Srivoranart, Ajarn Dr. Nureeda Hayiyakoh, Ajarn Scott Oltmann, and Ms. Yupin Chancharoensin, Director of Humanities Information Center. 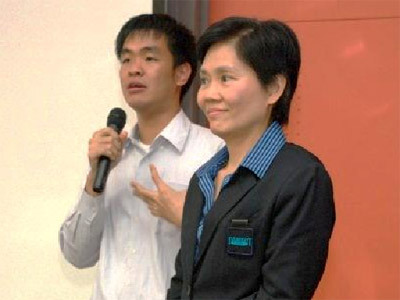 Ajarn Proud Sethabutr teamed up with an instructor from Vietnam National University of Ho Chi Minh City as MC. 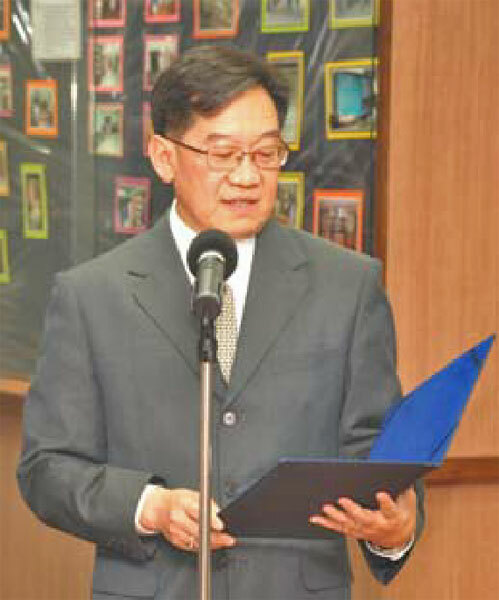 After the introduction of the faculty members of both universities, Deputy Dean Surapeepan Chatraporn gave a PowerPoint presentation of Chulalongkorn University and the Faculty of Arts This was followed by the traditional exchange of gifts between the administrators of the two universities. A series of cultural performances, both traditional and modern, were alternately staged by students who had well rehearsed and dressed in elaborate cultural costumes. After the performances students mingled and took part in a variety of activities in which prizes were generously given by the Faculty of Arts. This event turned out to be a success which helped foster friendship and enhance better understanding between the two countries of ASEAN. The event ended with a group photo of all the joyful students and professors. On Saturday, July 14, the new intake of 100 BALAC students crowded eagerly into Room 301-302 of the Maha Chakri Sirindhorn Building for this year's BALAC Orientation Day. Accompanied by their parents and guardians, some of who had travelled from as far afield as Hat Yai and Chiang Mai, the students were treated to a full day of information sessions and welcoming activities. Elegantly emceed by Ajarn Dr. Thoesaeng Chaochuti, the day's proceedings got off to a winning start with a gracious welcome speech from the Dean of the Faculty of Arts, Assistant Professor Dr. Prapod Assavavirulhakarn. The Dean congratulated the new students on gaining entry into the BALAC Program and gently drew their attention to the rewards and challenges that lay ahead across the course of their coming studies. A fine example of the kind of academic success to which the new students should aspire was then provided as the Dean conferred awards on the top students from last year's cohort of graduating BALAC students. Four students graduated with First-Class Honours and were duly admitted to the BALAC Roll of Honour: Ms. Chernjuti Tempithak, Mr. Kris Chaiyawan, Ms. Laura Rand, and Ms. Alice Tsoi. As the student with the highest GPA, Chernchuti--who has secured entry into a Masters Program at the prestigious University of Oxford--was also conferred with a special award of outstanding achievement. In addition, two further students, Ms. Saowana Thakoonnan and Ms. Nuanpan Thamanovanish, were granted awards in recognition of their outstanding achievement in extra-curricular activities and community service. The new Director of BALAC, Associate Professor Surapeepan Chatrapon, then took to the podium, welcoming the new students and parents and giving them a lively overview of the BALAC Program, its history and objectives. This was followed by a range of further information sessions offered by the Deputy Dean for Student Affairs, Assistant Professor Sankavat Pradithpongse; the two BALAC deputy directors, Assistant Professor Dr. Duantem Krisdathanont and Dr. Brett Farmer; as well as a panel of former and current BALAC student representatives. One of the highlights of the day was an informative panel on professional opportunities and career paths, chaired by Ajarn Dr. Parida Manomaiphibul, and consisting of three former graduates of the Faculty of Arts who have gone on to very successful careers: Mr. Phanu Sungkhavon (Director, Information and Communication Technology Center, Office of the Civil Service Commission); Ms. Monrudee Gettuphan (Vice President, Aerodrome Standards and Occupational Health Department, Suvarnabhumi Airport, Airports of Thailand Public Company Limited); and, Ms. Montira Narkvichien (Communications and Outreach Officer of United Nations Women East and Southeast Asia). These three high profile graduates spoke frankly and entertainingly about their professional experiences and how best to maximize the value of an arts education in the modern day workplace. Students and parents were further able to mingle and get to know each other better over lunch and refreshment sessions and, by day's end, new friendships had been firmly established. All participants agreed that this year's BALAC Orientation Day was a very successful event that served effectively to welcome the new intake of students into the BALAC family and the Faculty of Arts. The Republic of Poland has of course been in the spotlight in Thailand this year as the co-host of the European Football Championship. But there is another reason for this nation in the heart of Europe to take center stage here, one that rings even closer to home: In 2012, Thailand and Poland are celebrating the 40th anniversary of their diplomatic relations. And our Faculty marked this occasion with an exhibition of the best Polish graphic art, entitled "Form and Spontaneity," at the Learning Commons of the new Maha Chakri Sirindhorn Building. The equally entertaining and erudite opening speech by co-host Dr. Jerzy Bayer, the Polish Ambassador, made sure that the opening ceremony on Friday, July 6, would turn out both appropriately formal and pleasantly spontaneous indeed—His Excellency effortlessly weaved together complex history and concerns of technique to tell the story of Polish art. Dean Assist. Prof. Dr. Prapod Assavavirulhakarn, Deputy Dean, Assoc. Prof. Surapeepan Chatraporn, Dr. Tomasz Gerlach (the primary organizers) First-Counsellor, Polish Embassy, and MC Ajarn Dr. Mattanee Palungtepin, together with many students and faculty, saw more cultural ties being strengthened and new bridges built. Undergraduates from our Faculty recited poetry by Polish romantics, Nobel Prize winners and heroes of the resistance such as Herbert and Szymborska. Thai SEA Write Awardee Zakariya Amataya answered the lyrical call with his own performance poems. Flutist Assoc. Prof. Charunee Hongcharu and violinist, her student, played Polish and Thai songs. The cultural treats even extended into the cultural realm, as the Embassy had kindly provided wine and Eastern European snacks, and offer that was received rather enthusiastically. Observers could overhear plans for further activities being made already, so we can expect to see more Thai-Polish events in the future. Special Talk on "Scholarships from the Office of the Civil Service Commission (OCSC or Kor Por), Fulbright, and the Australian Government"
Studying abroad and graduate degrees are becoming more and more essential; and hardly any topic is more sought-after than scholarships. Acknowledging this need, our Faculty's International Section organized a two-hour special talk titled "Scholarships from OCSC, Fulbright, and the Australian Government," held at 1.30 p.m. on Friday, 10 August 2012. Students were treated to information from and talks by Ms. Nuanpan Anekvanich, Human Resource Specialist from the Office of the Civil Service Commission (OCSC), Ms. Porntip Kanjananiyot, Fulbright Thailand Executive Director, and Mr. Chanvit Chanchaisombat, scholarship program officer from the Australian Embassy, while Associate Professor Surapeepan Chatraporn, Deputy Dean for International Affairs, was the moderator of the event. The venue of the talk was Room 301, Maha Chakri Sirindhorn Building. The speakers were warmly greeted by Assistant Professor Dr. Prapod Assavirulhakarn, Dean, who gave a short welcoming speech to the speakers and greeted all the students, setting the tone for a challenging yet useful session on overseas academic experience. The conference room was filled with over one hundred and twenty students who were looking for opportunities to find out about scholarships to study abroad. By word of mouth, the event had been publicized and eagerly anticipated far beyond our Faculty, so that apart from Arts students, members from the Engineering, Fine and Applied Arts, Architecture and Political Science Faculties showed up as well. The audience was given detailed information concerning the different types of scholarships available, the nature of each type of scholarship, the application procedures, the necessary documents, and, particularly, tips for securing scholarships. The students also learned for the first time that OCSC provides funding for fourth-year students with a commitment to work for one year after graduation at a certain Government Office: they will be given scholarships to study abroad in the fields specified. As for the Australian Government, the audience learned that they offer a great variety of scholarship programs for students as well as working people in the region. Students can choose scholarship programs to suit their potential and interests. As for the Fulbright scholarships, the Fulbright Thailand Executive Director gave a very lively and dynamic presentation on all aspects of the scholarships complete with information and strategies to win a scholarship, proving that vital information can go together with a good sense of humor. She also brought along one of this year's Fulbright scholarship recipients to share his experience with the audience. The Director ended her talk emphasizing the prestige of the name Fulbright as well as awareness of community service and national contribution upon completion of the grants. During the Q&A session students came up with lots of questions and queries which, though specific to their interests, shed more light on the overall issues as well. The speakers entertained the audience with answers and some more advice pertinent to their individual differences. The event proved to be a great success, judging from the rave reviews from the audience. The fourth annual BALAC Trip to welcome new students into the Faculty's international program was recently held to great acclaim from 28 July to 1 August. Over 200 students, new and old, and members of the BALAC faculty and staff journeyed to the Ravindra Resort at Jomtien Beach, Chonburi for three days of cultural events and team-bonding exercises. The Camp got off to an early start on the morning of 28 July as an impressive convoy of brightly coloured coaches pulled out from Chulalongkorn to ferry the excited participants to their destination in Chonburi. The first stop was the Royal Thai Navy Base at Sattahip where students were treated to a tour of the Navy's largest aircraft carrier, the HTMS Chakri Naruebet. A further tour followed of the adjacent Sattahip Turtle Conservation Centre where students enjoyed an informative talk about the centre's important work and had an opportunity to witness it first-hand with a visit to the turtle breeding centre and nursery ponds. Following lunch, the group moved on to an afternoon of community service at the Wat Na Jomtien School, a public school for local children from pre-school levels through to Pratom 6. The dedicated teachers and fresh-faced young pupils of the school extended a very warm welcome to their visitors with kind speeches and refreshing drinks. In return, the BALAC team donated a collection of musical instruments to the school and then treated the young children to an afternoon of organized lessons and games. It was a most rewarding experience for all concerned. The group then made its way to their final destination at the Ravindra Resort where the first evening was given over to a series of activities in the hotel's ballroom. The BALAC Director, Associate Professor Surapeepan Chatraporn opened proceedings with an engaging welcome speech to the new students. This was followed by an equally entertaining presentation from Assistant Professor Sankavat Pradithpongse, the Deputy Dean for Student Affairs. Afterwards, students were treated to a screening of The Secret of Kells, a 2009 Irish animated film, introduced by Ajarn Dr. Brett Farmer, one of the two BALAC Deputy Directors. Day 2 of the trip was taken up with student-led activities as the BALAC sophomores, juniors and seniors initiated the new 'freshers' into the BALAC student community. Groups of students could be seen all over the resort's extensive grounds playing, singing, dancing and generally having a fun-filled time, often to the bemusement of the resort's other international guests. In the evening, the students put on a series of performances for their younger peers, displaying an impressive range of performing talents and an often keen sense of humour. The evening culminated in a moving 'bai sii su khwan' ceremony where, ushered into a hushed, candle-lit room, new students received the blessings and best wishes of their seniors and BALAC faculty and staff. Following a late breakfast, the group assembled one last time in the lobby to board the waiting buses for the journey back to Bangkok, bleary-eyed but very happy. All agreed that the trip had been a great success and had served well to make the new students feel a welcome part of the BALAC family and the Faculty of Arts. Above all, the students have learned how to give and to share with the less fortunate children in a rural school. 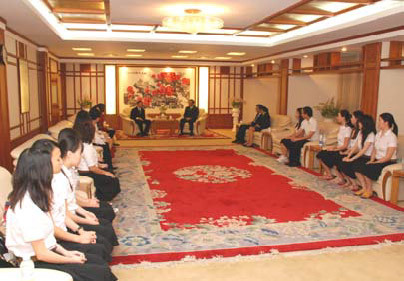 At 4.00 p.m. on 9 March 2012, 26 exchange students from Chengdu University had the chance to meet an illustrious countryman: Led by Assistant Professor Dr. Prapod Assavirulhakarn, Dean of the Faculty of Arts, Associate Professor Surapeepan Chatraporn, Deputy Dean for International Affairs, academic advisor Ms. Preena Manomaivibool, and Dr. Prapin Manomaivibool, honorary advisor to the exchange program, they paid a visit to the Chinese ambassador to Thailand, H.E. 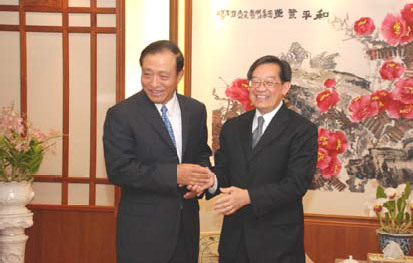 Guan Mu. They were greeted on arrival by the Attaché for Education, Chu Ning. The Dean took the opportunity to congratulate Ms. Shuhua Qi, for winning the second prize at the speech contest organized for students in international programs in Thailand celebrating His Majesty the King's 84th birthday. H. E. Guan Mu expressed his appreciation to the Faculty of Arts for taking good care of the students and gave them valuable words of advice. 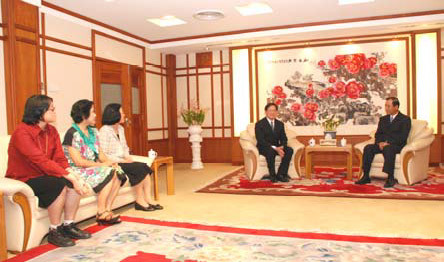 The visit which lasted over 2 hours ended with the Dean presenting a souvenir to the Chinese ambassador and a photo of the group being taken in front of the embassy. 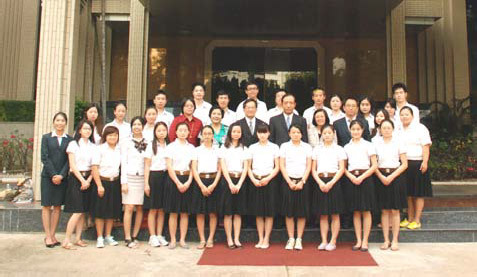 The 26 students from Chengdu attended classes at the Faculty of Arts during the second semester 2011 and were due to return to China on 30 March 2012. Pitting the top foreign students of Thai against each other in a competition that involves both prepared and impromptu speeches on complex topics, the "International Tertiary Education Speech Contest," the brainchild of the Chulalongkorn University Alumni Association (CUAA), is one of the toughest tests for learners of the language of the Land of Smiles. And the Faculty has reason to celebrate that one of its own went on to shine in the contest, held to celebrate His Majesty the King's 84th birthday on 11 February 2012 at the Arnoma Hotel: Ms. Shuhua Qi, an exchange student at the Faculty of Arts and originally a Thai major from Chengdu University in China, emerged as the first runner-up with her well-thought-out ideas on "Thai People living well through Royal Initiated Projects" and her spontaneous thoughts on the topic "Perseverance brings success." 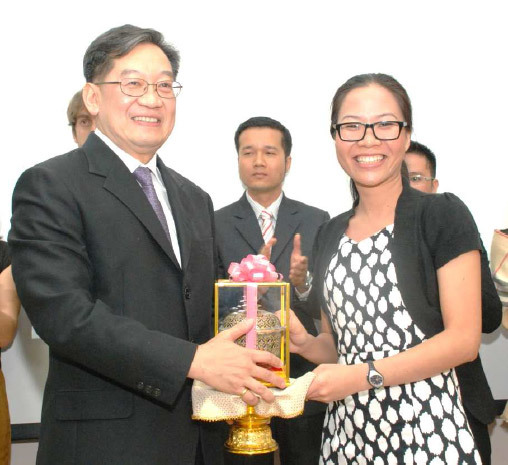 Her successful performance within the field of students from eight countries currently studying at 24 educational institutes in Thailand earned her a 10,000.-Baht cash prize and a trophy in honor of H.R.H. Princess Maha Chakri Sirindhorn. Attending the opening ceremony of the speech contest were Professor Dr. Suchada Kiranandana, CUAA's Vice President, Assistant Professor Dr. Pornthip Pookpasuk, Chairman of the organizing committee, and Khunying Patama Leeswadtrakul, Chairman of the Executive Committee of the Arnoma Hotel Bangkok and the Felix River Kwai Resort Kanchanaburi, who provided the venue and refreshments. The Islamic Republic of Iran and the Kingdom of Thailand can boast 330 years of relations, dating back to the reign of King Narai. 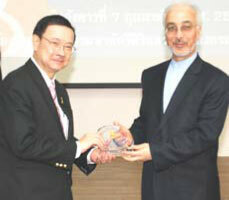 This astounding fact, together with the 33rd anniversary of the founding of the Islamic Republic, gave rise to the "Iranian-Thai Cultural Week" jointly organized by the Faculty of Arts and the Iranian Embassy from 7 to 10 February 2012. Aimed at promoting cultural relations between the two countries, the event included, among several highlights, an exhibition of Persian drawings by Iranian artists, Persian handicrafts and the screening of Iranian films. H.E. 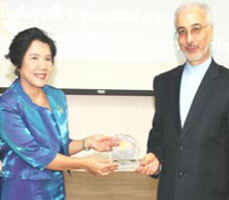 Majid Bizmark, the Iranian Ambassador to Thailand, and Chulalongkorn University's President Professor Pirom Kamolratanakul presided over the opening press conference of the high-profile event in the Maha Chakri Sirindhorn Building. Among the approximately 100 people attending were Thai and foreign diplomats, academics, businesspeople and exchange students. The press conference was then held at the Learning Commons room on the 2nd floor. About 50 people representing local and overseas television, radio stations, and newspapers were invited. 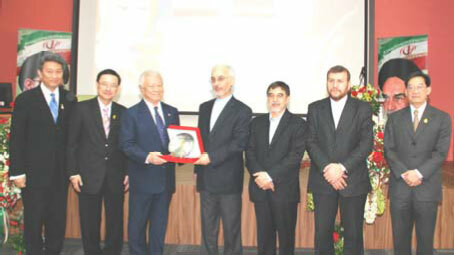 The conference was broadcast live to Iran and Iranian embassies worldwide. It was succeeded by a ceremony to launch the Cultural Week proper in room 304. 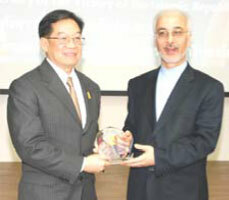 The highlight was the presentation of the 2012 Ahmad Qumi award by the Iranian Ambassador to General Banjob Bunnag, president of the Ahmad Qumi Foundation, for his role in establishing good relations between Thailand and Iran. 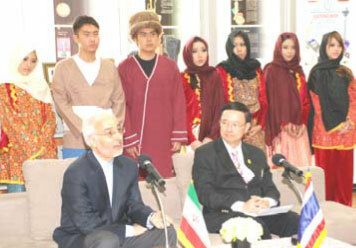 Before the ceremony ended with a display of Iranian traditional costumes worn by Arts students, H.E. Majid Bizmark presented souvenir plates to the Chulalongkorn University President, Assistant Professor Dr. Prapod Assavavirulhakarn, Dean of the Faculty of Arts, and Associate Professor Surapeepan Chatraporn, Deputy Dean for International Affairs. 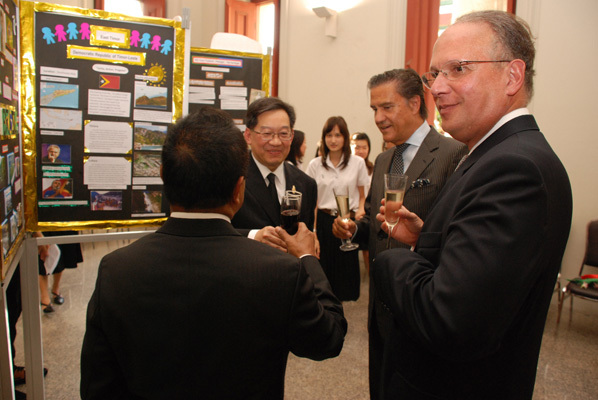 For a Faculty concerned with language and culture, 500 years of diplomatic relations between Portugal and Thailand are more than enough reason for both celebration and academic study. 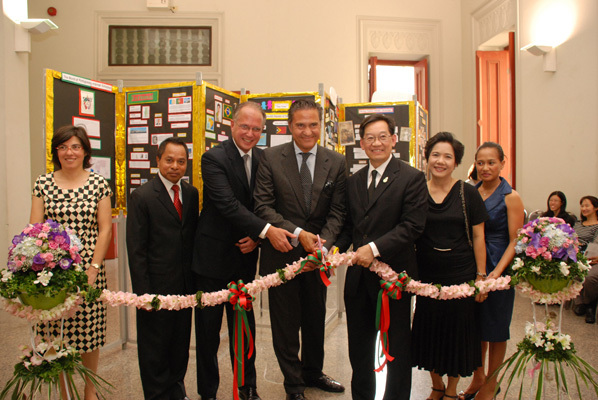 The Section of International Affairs, in close cooperation with the Embassy of Portugal, combined these with their Portuguese Language and Culture Week, held from August 22 to August 26, 2011. 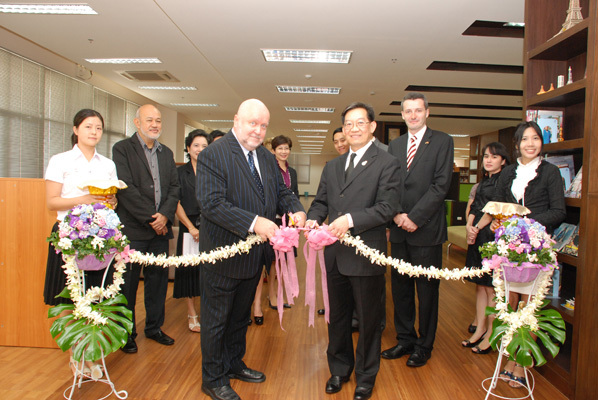 The opening ceremony took place in the evening of August 22, 2011 in the foyer of Maha Chulalongkorn Building. Presiding over the ceremony were Assistant Professor Dr. Prapod Assavavirulhakarn, Dean of the Faculty of Arts, and H.E. 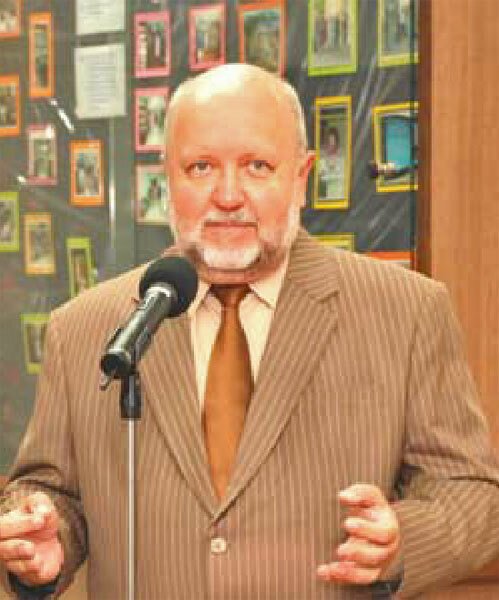 Dr. Jorge Ryder Torres Perreira, the Portuguese Ambassador. Dean Dr. Prapod gave a warm welcome speech to participants who were from various areas ranging from the diplomatic, the media, the business to the academic circle. H.E. Dr. Jorge Ryder gave a opening speech full of descriptive details, placing emphasis on not only the long-standing diplomatic relations between Portugal and Thailand in successive periods in Thai history but also the personal friendship of numerous national figures.This was followed by two congratulatory speeches by H.E. 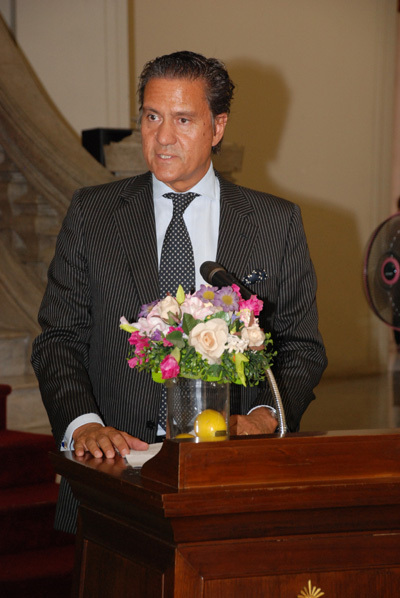 Mr. Paulo Cesar Meira de Vasconcellos, the Brazilian Ambassador, and by H.E. 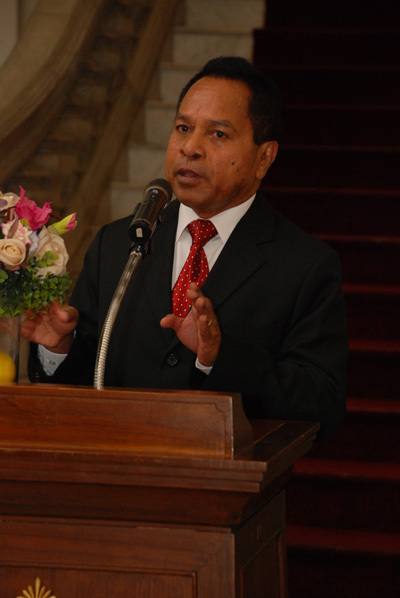 Mr. Joao Freitas de Camara, the Ambassador from Timor-Leste. The Ambassador from Timor-Leste was accompanied by his wife who expressed her interest in enrolling in an evening language program of the Faculty. The opening ceremony ended with friendly socializing and networking among the guests of honor and participants in a cocktail party featuring Portuguese and Thai pastries, dessert, and drinks. On August 24, 2011 in the foyer of Maha Chakri Sirindhorn Building there were demonstrations of Portuguese cultural dances in national costumes. The performers were Arts students who take Portuguese courses, and Portuguese instructors. The event drew a lot of attention from the students as well as the passersby. On August 26, 2011, the last day of the Portuguese Language and Culture Week, a talk on "Careers and the Portuguese Language" was held in Room 401/17, Maha Chakri Sirindhorn Building. The speakers included guests from the Embassy of Portugal and the Embassy of Brazil, famous translators, and successful Arts alumni. Throughout the Portuguese Language and Culture Week, there were the exhibition, books, and magazines on display, sampling of Portuguese classical and popular songs as well as screening of Portuguese films and documentaries in the Learning Commons, Maha Chakri Sirindhorn Building. "The Evolution of the Parliamentary Traditions of Hungary and Poland" is a rich and fascinating topic--and provided the occasion for a collaboration between the Section of International Affairs, the Humanities Information Center, the Embassy of Hungary and the Embassy of Poland.The result was a unique exhibition, held from August 17 to August 22, 2011 at the Learning Commons in our new Maha Chakri Sirindhorn Building. The opening ceremony, which took place in the afternoon of August 17, 2011, was presided over by Assistant Professor Dr. Prapod Assavavirulhakarn, Dean of the Faculty of Arts, H.E. Dr. Jerzy Bayer, the Polish Ambassador, and Mr. Peter Jakab, Deputy Head of Mission, Embassy of Hungary. The Dean gave a welcome speech followed by opening speeches by H.E. Dr. Jerzy Bayer and Mr. Peter Jakab respectively. 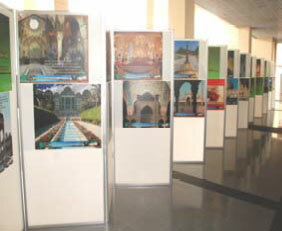 After the opening ceremony the Dean cordially invited all the participants to view the exhibition. Then all were invited to proceed to the DVD room to enjoy the screening of two documentaries introducing the essences of Poland and Hungary. The event ended with a lavish cocktail party in front of the Learning Commons. Food and beverages were catered from the kitchen of Madame Malgorzata Kibilda-Bayer, the wife of the Polish Ambassador, who personally made sure that all the guests had good bites of the Polish dishes and pastries. The participants included guests of honor from various embassies and international organizations, participants from the European Studies Program, faculty members as well as Arts students. The atmosphere was very warm and friendly with everybody socializing and enjoying themselves with various activities. As a gesture of thankfulness to the Faculty of Arts, Dr. Tomasz Gerlach, First-Counsellor, Polish Embassy, presented big, colorful bouquets of flowers to Dean Dr. Prapod, Deputy Dean for International Affairs, Associate Professor Surapeepan Chatraporn, and Khun Yupin Chancharoensin, Director of the Humanities Information Center. These bouquets which came as pleasant surprises would be both tokens of appreciation and reminders of our cordial relations that will continue to blossom for many years to come. 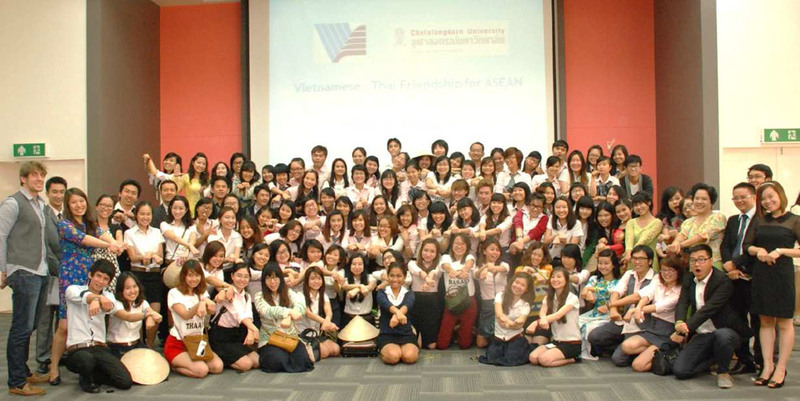 The Section of International Affairs, together with the Section of Academic Affairs, and the Humanities Information Center, joined hands to arrange a cultural exchange activity with the Vietnam National University of Ho Chi Minh City on Thursday January 13, 2011. The activity took place in Room 304, Maha Chakri Sirindhon Building. 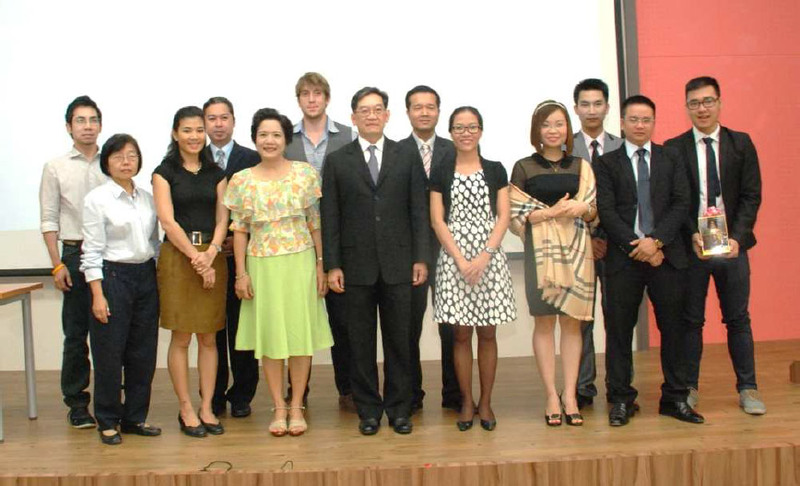 There were altogether six professors and ninety-six Vietnamese students joining in the event. Assistant Professor Dr.Prapod Assavavirulhakarn, Dean, Associate Professor Surapeepan Chatraporn, Deputy Dean for International Affairs, Assistant Professor Sunij Sutanthavibul, Deputy Dean for Academic Affairs, Assistant Professor Sankavat Pradithpongse, Deputy Dean for Student Affairs gave a warm welcome to the Vietnamese professors and students, led by Professor Bui Hai Dang, Deputy Dean, Faculty of International Relations. 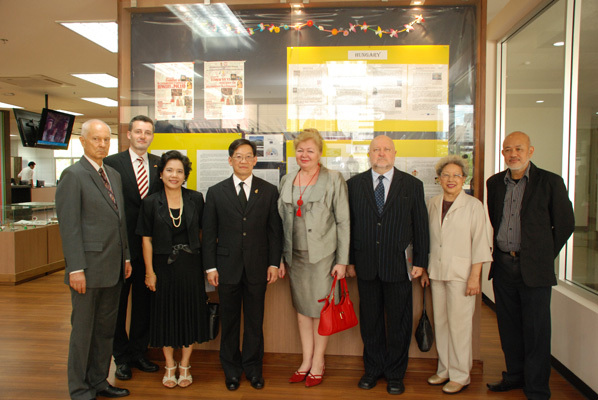 The International Affairs Section and the Academic Services Center, Faculty of Arts, in collaboration with the German Embassy, held an exhibition on the history of German Division and Reunification from November 8 – 30, 2010 on the mezzanine level of the Maha Chakri Sirindhorn Building, the first exhibition to be housed in the Faculty's new state-of-the-art building. On the opening day of the exhibition, dignitaries, faculty members, students and guests gave a warm welcome to H.E. Dr. Hanns Heinrich Schumacher, Ambassador of the Federal Republic of Germany, as well as the Deputy Chief of Mission and other diplomats from the German Embassy.The Ambassador, in his speech, also stressed the supportive and friendly relationship between Thailand and Germany, which has endured for a good number of years. A full and enthusiastic audience of Arts students turned out for the lunchtime talk on Fulbright and Government Scholarships, which took place in Room 210 of the Maha Chulalongkorn Building from 12 till 2 p.m. on Friday, August 27, 2010. The audience’s eagerness was rewarded when the two prominent speakers, Ms. Porntip Kanjananiyot, Executive Director of Fulbright, and Mr. Phanu Sungkhavon, Director of the Recruitment and Selection Center of the Office of the Civil Service Commission, took the podium to deliver engaging, informative presentations. The audience of this event comprised approximately 100 seniors who had pre-registered and also a few parents who attended on behalf of their children. To follow up from the US Ambassdor's visit to the Faculty of Arts, the Section of International Affairs joined forces with the Section of Academic Affairs and the US Embassy in organizing a Visual Thinking Strategy Workshop(VTS) for faculty members and students on January 29, 2010. The US Embassy graciously provided a leading expert to helm the workshop, Prof. Philip Yenawine, former Director ot several museums in the U.S. including the Metropolitan Museum of New York, and a visiting professor at numerous universities. "Tulpan" (Kazakhstan), "Mid-August Lunch" (Italy) and "Revanche" (Austria)-- all of which have never been commercially released in Thailand. Her Royal Highness Princess Maha Chakri Sirindhorn had kindly bestowed sandwiches and cakes of various flavors as part of the food for the feast.The party started with a brief talk from the Dean, followed by a mix of short performances and games designed to get all participants involved and interacting. Persuading everybody to join in, Ajarn Saowaluck Suriyawongpaisarn and Ajarn Michiko Imai from the Japanese Section introduced two dances: “Daode xinxi” and the “Healthy Dance for Body and Mind.” Not to be outdone, Ajarn Zhang Zongzheng, Ajarn Fan Chunming, Ajarn Fan Ying, Ajarn Ji Hong Fang, Ajarn Fu Zengyou, Ajarn Yang Pinping , Ajarn Yang Lijun and Ajarn Sasiporn Petcharapiracha from the Chinese Section and the Confucius Institute continued the parade of cultural gems with their performance of a folk song of Jiangsu Province, entitled “Jasmine.” Ajarn Alexey Ryzhov (Russian Section), who would prove to be a veritable Pictionary wizard in the game section later on, sang a melodious folk song from his homecountry by the name of “Black Raven,” while Ajarn William Handrich from the English Department, staging a “Pyramus and Thisbe” scene from Midsummer Night’s Dream, showed that all it takes to bring the spirit of Shakespeare to life is one single actor and (a lot of) props. As for games, Ajarn Ingo Peters, Ajarn Brett Farmer and Ajarn Mattanee Palungtapin got the party guests to either draw or shout their interpretations of the drawings out in the abovementioned Pictionary. Afterwards Ajarn Soleeheen Raseuy from the Malay Section won the crowd over with the song “Sepohon Kayu,” followed by a lively Burmese song-and-dance performance by the Burmese students from the Thai Studies Program. 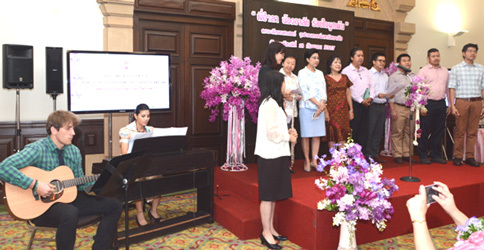 The party concluded with everybody joining in the Christmas carols and the traditional Thai New Year’s song. This event was the first official activity of the Section of International Affairs. 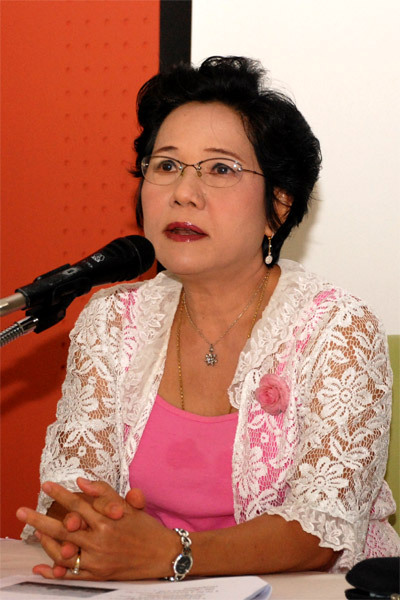 On October 23, 2008 in the main auditorium of Chulalongkorn University, the Faculty of Arts in collaboration with the French Embassy, the Thai Association of French Teachers, the Government Public Relations Department, and the Bangkok Combined Choir and Orchestra held a memorial concert, "Grlyani Karawalai," in commemoration of Her Royal Highness Princess Galyani Vadhana Krom Luang Naradhiwas Rajanagarindra and, in particular, her significant contributions to the country and the people in numerous fields including French studies. Apropos the latter, Her Royal Highness graciously assumed the position of Special Lecturer of French in the Department of Western Languages, where she taught from 1952 to 1958. The courses she instructed included French conversation for sophomores, French culture for juniors, and French literature for seniors.